“This structural system has fascinating implications for dynamic architecture including portable shelters, adaptive building facades and retractable roofs,” said Chuck Hoberman of the Graduate School of Design. Harvard researchers have designed a new type of foldable material that is versatile, tunable, and self-actuated. It can change size, volume, and shape; it can fold flat to withstand the weight of an elephant without breaking, and pop right back up to prepare for the next task. The research was led by Katia Bertoldi, the John L. Loeb Associate Professor of the Natural Sciences at the John A. Paulson School of Engineering and Applied Sciences (SEAS); James Weaver, senior research scientist at the Wyss Institute for Biologically Inspired Engineering at Harvard University; and Chuck Hoberman of the Graduate School of Design. It is described in Nature Communications. 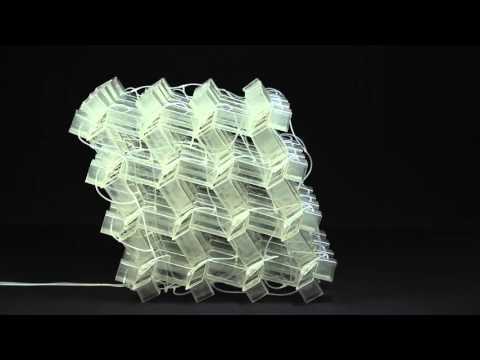 “We’ve designed a 3-D, thin-walled structure that can be used to make foldable and reprogrammable objects of arbitrary architecture, whose shape, volume, and stiffness can be dramatically altered and continuously tuned and controlled,” said Johannes T.B. Overvelde, a graduate student in Bertoldi’s lab and first author of the paper. The structure is inspired by an origami technique called snapology, and is made from extruded cubes with 24 faces and 36 edges. Like origami, the cube can be folded along its edges to change shape. The team demonstrated, both theoretically and experimentally by a centimeter-scale prototype, that the cube can be deformed into many different shapes by folding certain edges, which act like hinges. The team embedded pneumatic actuators into the structure, which can be programmed to deform specific hinges, changing the cube’s shapes and size, and removing the need for external input. This paper was coauthored by Twan A. de Jong, Yanina Shevchenko, Sergio A. Becerra, and George Whitesides. The research was supported by the Materials Research Science and Engineering Centers, the National Science Foundation and the Wyss institute through the Seed Grant Program.